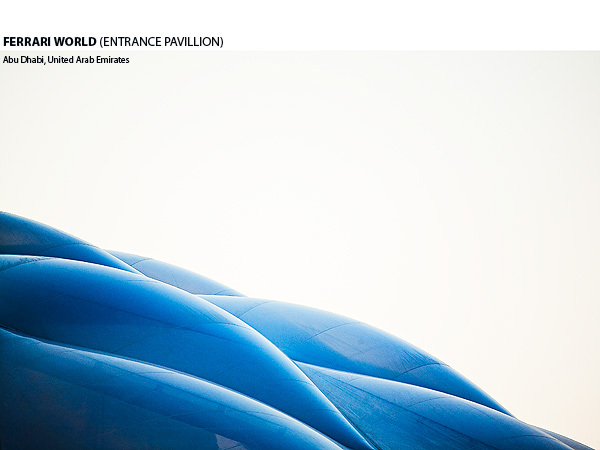 Situated beneath a 200,000 square metre roof Ferrari World Abu Dhabi is the largest indoor amusement park on earth. Officially opened on Tuesday 30th November 2010, amidst a star-studded lavish function on Yas Island, the park is also home to Formula Rossa the world’s fastest roller coaster which accelerates on a hydraulic catapult to 240km/h in under 3.5 seconds from a standing start. Designed by Benoy Architects in the UK, construction started in November 2008 and was completed within a staggering two years. The perimeter of the building measures 2.2km with 86,000 square metres of indoor air-conditioned play area for all the rides and attractions. It has the largest space-frame structure ever built with a total of approximately 172,000 members and 43,100 nodes, and at 65 metres long it has the largest Ferrari logo ever created adorning its massive Ferrari-red roof. 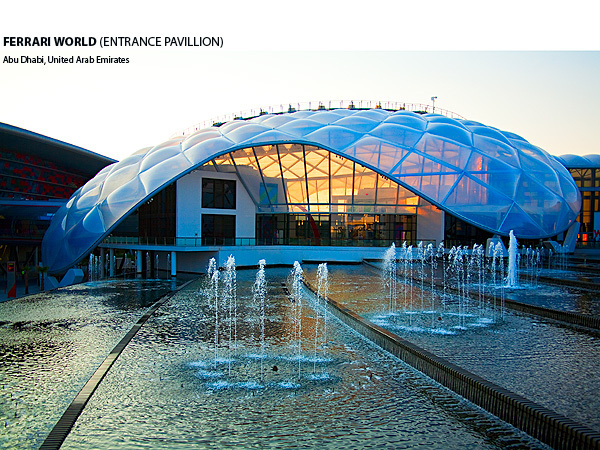 The beautiful entrance pavilion (shown below) is covered with an illuminated pneumatic ETFE (polyethylene tetrafluoroethylene) polymer roof membrane which changes colour periodically and wows visitors from the moment they walk out of the collossal car park and into the indoor theme park.